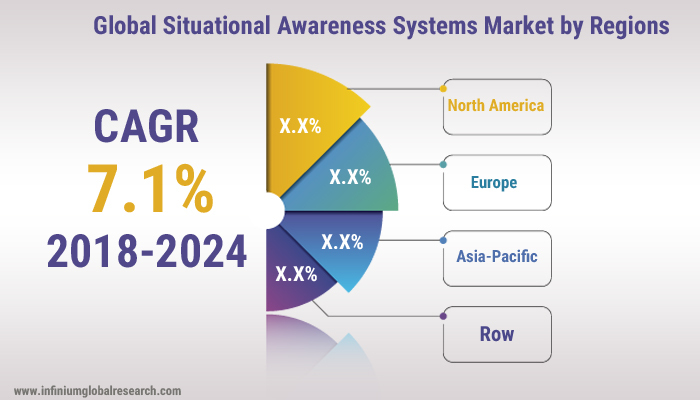 A recent report published by Infinium Global Research on situational awareness systems market provides in depth analysis of segments and sub-segments in global as well as regional markets of situational awareness systems market. The study also highlights the impact of drivers, restraints and macro indicators on the global and regional markets of situational awareness systems over the short term as well as long term. The report is a comprehensive presentation of trends, forecast and dollar values of global situational awareness systems market. According to report the global situational awareness systems market is projected to grow at a CAGR of 7.1% over the forecast period of 2018 - 2024. The countries covered in the North America region include the U.S., Canada, and Mexico; while Asia-Pacific includes China, Japan, India, South Korea, Malaysia and among others. Moreover, European region covers countries such as Germany, UK, France, Spain, and rest of Europe. The U.S. drives the growth in the North America region as it is the largest market in the region. The Asia-pacific region offers a substantial potential for the market growth owing to rapid growth in markets such as India and China. The APAC region is projected to experience a growth at a CAGR of x.x% over the period of 2018 - 2024.